I read Soule Mama's blog daily and this morning sent me into a fit. My mind started throwing a tantrum and all I heard in my head during breakfast was, "She homes schools four children, is pregnant with her fifth, and still gets to knit and sew all the time. (now in a really whiny voice) Why don't I get to do those fun things? Why can't I make whatever I want, when I want." And so I sewed. I thought my kids would pitch a fit, but really they played by themselves for most of my project. Only when I was sewing on buttons did my tiny guy realize what I was trying to do. It felt so good to sew again. I have been missing it. Aunt Shirley and Cousin Erin gave me some vintage aprons. Now they are in dress form for little Holly to wear during the summer. No pressure Erin! You can just take a picture of her in it, send it to me, and then donate the thing if you hate it. It only took me about 30 minutes to make this dress. The rest of the day was spent lunching with Grandma and then participating in Blake's first "Little Sportsters" class at the YMCA. 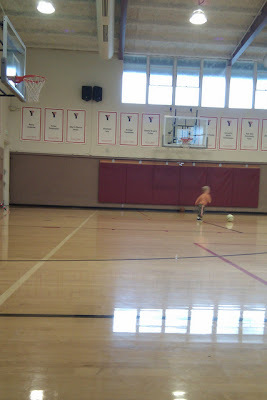 He loved the class and learned the fundamentals of soccer. Coach Larry is the best. The smile on my face was ear-to-ear so watch out world, here comes another soccer mom (I would prefer another sport that was played indoors so I don't have to sit out in the cold and cheer). Oh my goodness Shannon, you shouldn't have! The dress is absolutely darling and will look great on Holly! Thanks, your the best! Shannon what a good idea.....so cute.Maybe your next one will be a girl?? I thought I wanted a girl, but now I don't want to interfere with all the testosterone that flows around this house. Three boys might just put me in some obscure tax bracket where I can deduct all of their medical costs due to a high volume of ER visits?